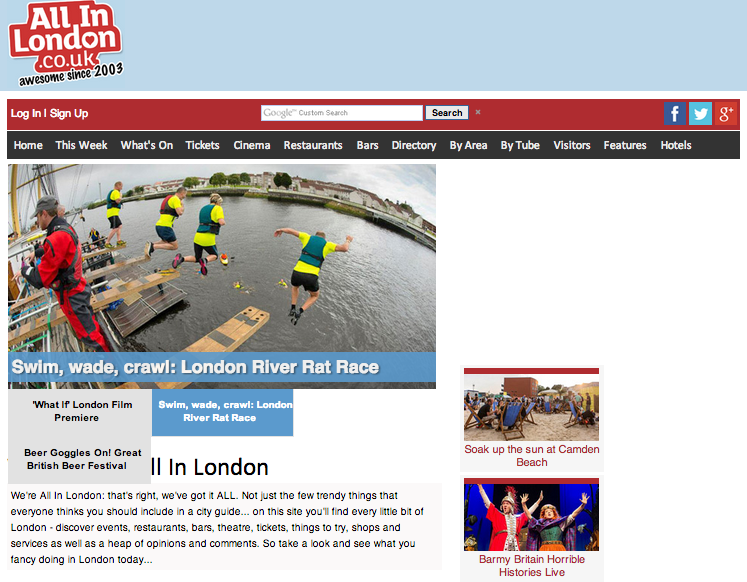 Founded in 2003, AllinLondon.co.uk really does have it all, from info on all the best bars, restaurants and hotels to business directories and up to date news on current events and activities. It has all you need to know about the capital, whether you’re planning a weekend in London, or a local looking for something to do after work. With a cinema guide, as well as listings for comedy, clubs, exhibitions and festivals, you can plan what you want to do at any time of day. Minor setbacks include the somewhat cluttered feel on some of the pages. AllinLondon.co.uk provides information on all current events and activities, as well as hotel information, bar and restaurant guides and almost anything else you want to find out about the capital. It’s ideal for those wanting to plan a day or night out, or just read up and learn more about London. Go back to our Events and Gigs page for more of the best offers on events throughout the capital.